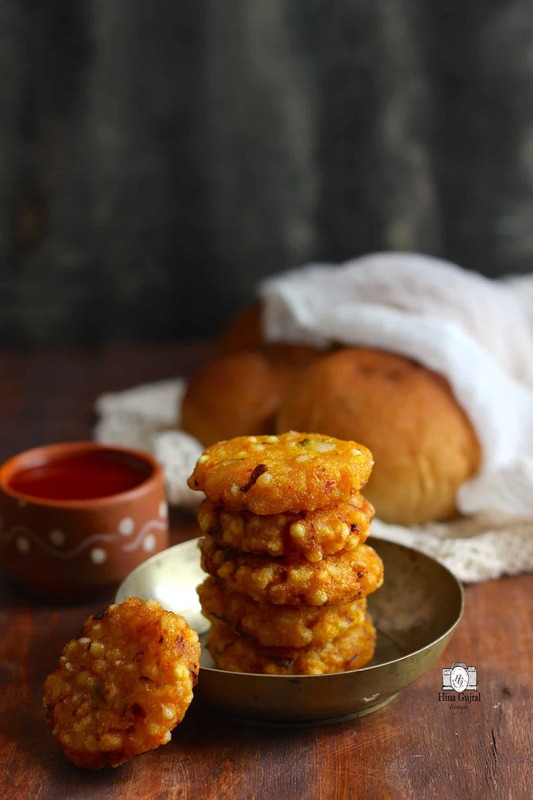 Sabudana Vada also known as sabudana tikki, is a traditional Marathi snack. This delicious, crisp deep-fried piece of goodness is often served with spicy coriander chutney along with a cup of masala tea. 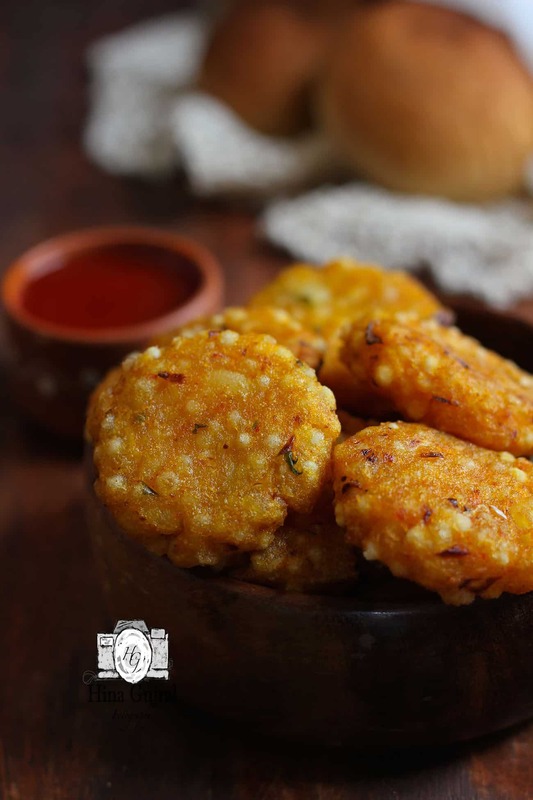 Sabudana Vada is an excellent teatime snack perfect for any season or occasion throughout the year. Perfectly crunchy exterior and mouth-melting mashed potato filled interior make this Indian snack an all-time favorite. As a family, we all equally enjoy sabudana cutlet for breakfast as well as a snack. In a Punjabi kitchen like ours, sabudana cutlet is prepared with loads of chopped onion, ginger, garlic and Chaat masala going in the batter. And it tastes genuinely delectable. Try this combination of ingredients in sabudana cutlet to believe my words. Only on certain religious occasions, we prepare these cutlets true Marathi style without onion/garlic. Both the versions of this humble cutlet are so distinct in flavor, and one could easily fall in love with each one of them. 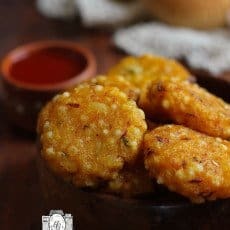 How we Punjabis relish sabudana vada? 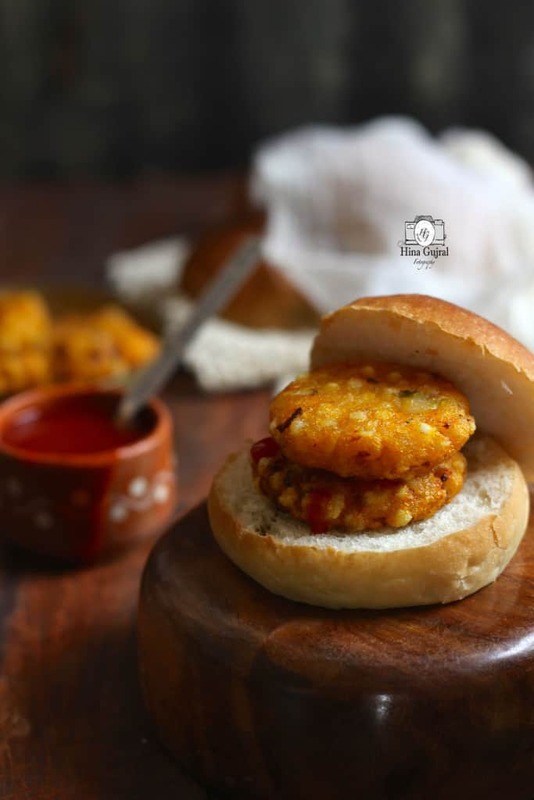 All you need is cute little burger buns or Mumbai pav. Take a giant piece of the cutlet, sandwich it in between the soft bread pieces, generously slather lip-smacking my signature green chutney and a generous dollop of tomato ketchup. This combination is often our family’s indulgent weekend breakfast or a fulfilling evening teatime snack. If you want to make sabudana cutlet for the festival of Navratri then please make sure these ingredients are not used – onion, garlic, turmeric, table salt, spices, and refined oil. To make a sattvic vada all you need is – sago/tapioca pearls, boiled and mashed potatoes, green chili, fresh coriander, rock salt (optional), black pepper, crushed peanuts, and ghee. Combine all these ingredients as suggested in the recipe below and deep-fry the shaped cutlets in ghee (clarified butter). If you are observing any kind of fast, sabudana tikki is a fantastic fulfilling snack. If you are not too keen to shape the cutlet into the perfect round then simply pinch a small portion of dough mixture using your fingers and gently drop it in hot ghee for frying. The bite-size sabudana pakodi taste exquisite and are best served with grated radish and mint chutney in a typical street food fare style. In the sabudana vada recipe below, we have followed the Marathi method to prepare the cutlet. The nuttiness of crushed peanuts, earthiness of roasted cumin powder and the freshness of coriander leaves gives cutlet an outburst of flavors. Once you fall for this tempting vada, it is so hard to stop at one or two pieces. 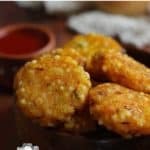 How To Make Crispy Sabudana Vada? To make crispy sabudana vada I follow these two tricks and never failed. Firstly, boil the potatoes well in advance, allow to cool down a bit and keep in the fridge with skin until you need them. The chilled firm potatoes do some kind of magic to the texture of the cutlet turning them into golden goodness. Secondly, never ever add too much water while soaking tapioca pearls. If you are using one cup of sago pearls then one plus one-fourth cup of water is sufficient to soak the tapioca. Too much water while soaking makes sago pearls mushy and water clogged, resulting in a not so crisp cutlet. Hope these two tips would help you to make crisp sabudana vada each time. If you try this recipe and love it, please leave a comment and a rating. 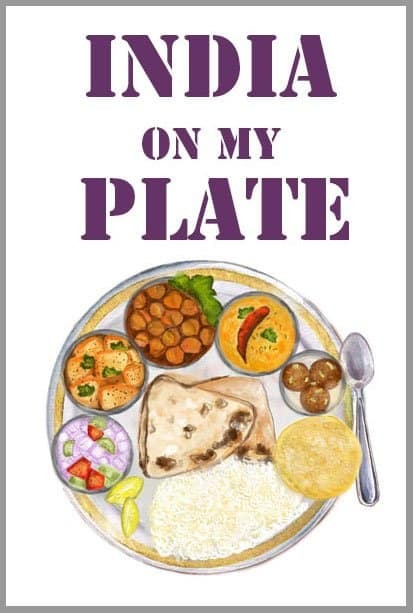 This helps us grow and reach many other food lovers like you, who are looking for perfect tried and tested Indian food recipes. 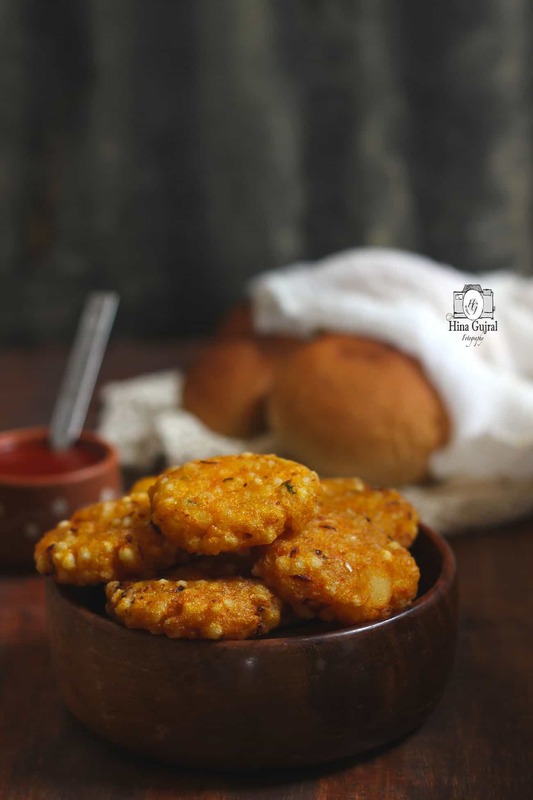 Sabudana Vada is a popular Marathi snack prepared with tapioca/sago pearls and potato. 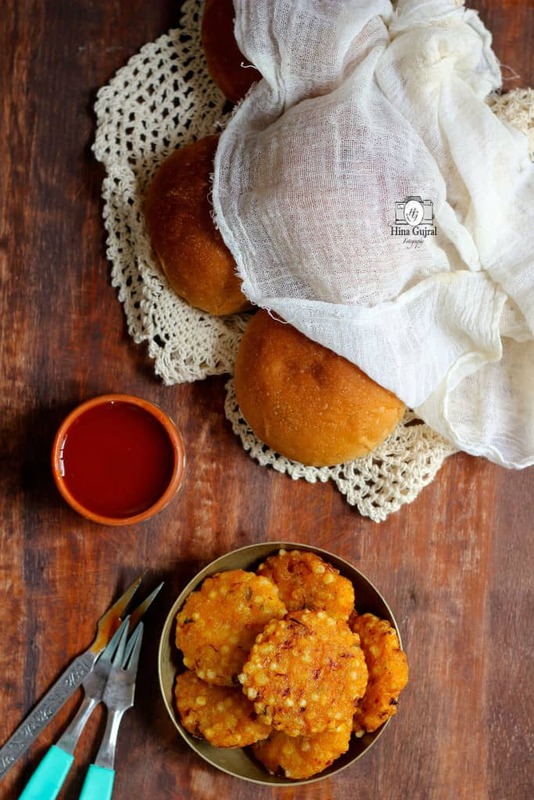 Learn how to make crispy Marathi style sago vada in a few simple steps. To prepare the Sabudana Vada, soak the tapioca pearls, in 2 Cups of water for about 3 - 4 hours or overnight. To prepare the mixture for the vadas, in a large mixing bowl (buy it here) combine boiled potato, soaked sago pearls, ginger, chili, peanuts, coriander, salt, and spices. Mix thoroughly while mashing the mixture with your finger to form a smooth non sticky dough like mixture for the vadas. Heat oil for deep frying in a pan (buy it here) over medium flame. While the oil is heating, divide the mixture into small sized balls. Next, flatten the balls to half an inch or so thickness gently using fingers. Deep fry the vadas in small batches in hot oil till golden brown and crisp from both the sides. Drain Sabudana Vada on an oil absorbent paper. Serve Sabudana Vada with green chutney and a cup of tea. Soak sago pearls in enough water just to moisten it not to make it mushy. Once soaked there should not be any excess water remaining in the bowl. If you do not have roasted peanuts at home, gently dry roast the peanuts on a pan for 3 - 5 minutes. Allow to cool. Rub in between your palms to remove the skin. Crush using a rolling pin or food processor. I usually boil the potatoes beforehand and keep them in the fridge. This way, I always get perfectly crisp sabudana vada. Very inviting n perfect looking vada! !